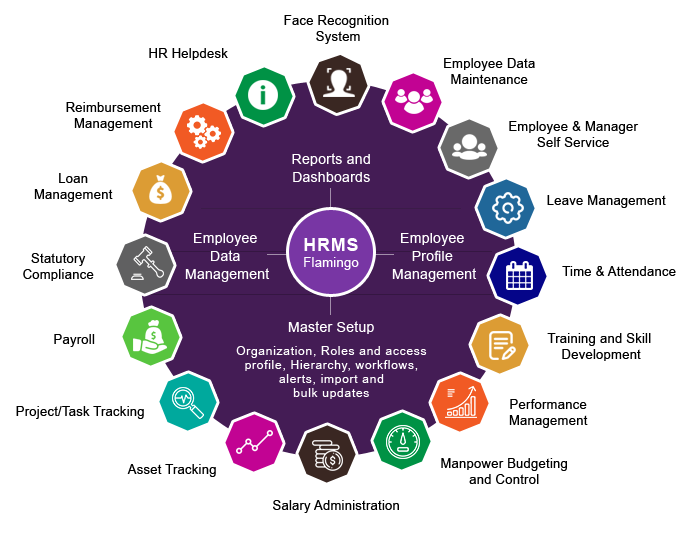 A comprehensive HRMS suite to manage employee information, attendance, payroll and employee self-services. Flamingo HRMS software is a simple, intuitive, and user-friendly solution that offers a diverse of technology modules to assist in automating your human resource practices. The feature-rich application is programmed to manage employee information, payroll, time and attendance of all departments in an organization. It seamlessly integrates with your existing biometric devices to make attendance process easier and faster. Flamingo comes with enormous user-friendly features and options that benefit your organization from the day one of the installation. Human resource management module regulates the gap between the employee and management by maintaining a transparent centralized database containing real-time data of all employees. The Employee information management module includes the following features. Employee database holds the personal data of each employee including their family details, history of work experience and educational qualification history. Unique numbering option in the database auto generates the employee number based on their category or divisions. The employee information management module maintains the organization tree that obtains the hierarchy of the company. It provides an explicit view of an organization structure by arranging head, team leaders, and respective members. Organization tree assists in various organizational workflows. Our HRMS software allows adding any number of employees and employee categories including their department, division, designation, function and etc for accurate reporting. It allows tracking the company assets such as systems, equipment, and other organizational properties provided to any employee. It facilitates to track the accommodation provided to any employee. Time and attendance focus on the employee attendance by recording the values of an employee in and out time by integrating with the biometric device or Flamingo Mobile application. The integrated calendar present in the solution provides the insights on employee absence, attendance, leave, OT and etc. Our HRMS solution can seamlessly integrate with your existing biometric devices, RFID, smart cards, and etc. In absence of the time tracking device, we install a new time tracking device and integrate our systems. Flamingo records the arrival and leaving time of each employee by obtaining the accurate punching time. The attendance record can be configured to meet the company requirements. The time and attendance provide the following reports. It handles the manual punches of employees, punch discrepancies, relive management and shift roaster. Handles Discrepancies: The administrator can handle the discrepancies or variations in the punching data. The user can add missed punch or remove the extra punches. Flamingo facilitates in handling exceptions such as late reporting and early exists. It allows tracing the details on employee attendance, shift rosters and etc. It assists in finding the day wise or month wise data by providing the list of prolonged working hours and late-comers. The attendance records enable filtering the categories such as location, department and etc. The employee time and attendance module can be seamlessly integrated with HR and payroll modules. Attendance, holiday calendars, and payroll will work altogether by avoiding user efforts, redundant values, and inconsistencies. It handles all aspects of salary management and computes the salary of all employees by clicking a button; the salary is calculated by considering account statutory deductions (PF/ESI/PT), loan deductions, stop payments, revisions, loss of pay, pro-data salary computation, and income tax computation etc. Calculates salary for enormous employees. Computes statutory, Income tax, gratuity, medical, final settlements, increments and arrears. HRMS is a flexible solution that meets all your evolving configuration needs; it allows defining or updating the values of Payroll master such as Allowances, deductions, and tax components. Inline compliance with the Attendance for the salary processing. It allows defining overtime wages for employees based on their category. It manages the authorized OT (over time) based on the request and approval. OT management section is restricted for unauthorized users to maintain the confidentiality. HRMS generates accurate, professional looking salary slip where the administrator can customize the appearance and content of it. The user can download the salary slip and print for future reference. The administrator can define the statutory parameters as per the company requirements; the user can also update various parameters according to the changing organizational policies. Our HRMS system handles all statutory deductions for PF, ESI, Professional Tax, TDS, etc with no manual interference. Tax deducted at source (TDS) calculations involves various clauses and sub-clauses to obtain an accurate salary figure and deducts the TDS automatically. The income tax management ensures the availability of reports such as monthly tax statement, form 16 & 12BA, Form 24Q and etc. Our automated HRMS solution can manage unlimited loans availed by employees and itself deduct the EMI. Flamingo can calculate the EMI for loans and also deducts from pay slip until the loan duration. It monitors the salary advances and deducts from the salary. The admin can find the details on arrears, reimbursements, bonus and manage the insurance policies of employees. Our HRMS solution can efficiently handle the following. Employee self-services module allows the employees to access the following details without relying on admin/HR. Team leaders or managers can view the details of their respective team members and accept or deny their requests. The employees can request leave/ permission to their reporting authority or manager and they can grant or deny the request sent by their team members. Flamingo product suite covers Android mobile application for all employees in an organization. The application will allow access to a self-service portal which easily synchronizes with HRMS web application and offers attendance features such as Punch, Leave, Permissions, and On-Duty markers. Flamingo Mobile app facilitates in tracking the employee attendance, absence, On duty, OT etc from the user’s mobile device anywhere on the globe. It allows the admin to find the employee’s location through the Geocode when he/she punches. Flamingo mobile application provides a map view for deducting the exact location of the employee during the punching time. The location tracking facility helps to claim the travel allowances by the particular employee. In recent times, the face recognition systems have come up with advanced features that detect human faces distinctively, in a group, crowded places, and in videos. These devices are featured with high-speed face matching functionality that detects the human faces in milliseconds. The face recognition systems can be extended to more cameras and able to capture faces within the videos. These systems can perform continuously at different places where a real-time control panel is offered to the monitoring person to verify the matched faces. Flamingo is being successfully implemented in large corporations of India and UAE. We offer product customization services to make our system to adapt to your local payroll and languages. Our user-friendly payroll software is built on Microsoft technologies for hassle free access. It is featured with security options to allow only the authorized users to access the restricted sections. The modular nature of the HRMS product allows faster customization process to build modules based on your business needs. With constructive methodology and project management process, we provide rapid implementation of HRMS software. Our software can successfully run on different industrial verticals including Manufacturing, Pharmaceuticals, Processed Foods, Construction, Packaging etc, and therefore, our product can incorporate some of the best HR practices in different industries. Flamingo can seamlessly integrate with the existing ERP, Financial systems and etc. Our software is developed with the help of industrial expertise, chartered accountants and customers, to perfectly match with every organization.